kajan is using Smore newsletters to spread the word online. 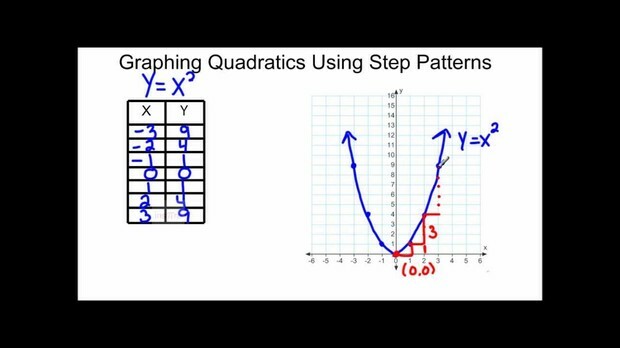 The name Quadratic comes from "quad" meaning square, because the variable gets squared. A quadratic equation is an equation having the general form ax2 + bx + c = 0, where a, b, and c are constants. 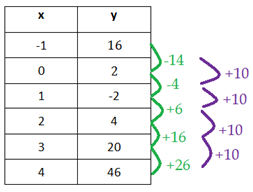 First and second differences determines if the relation is linear, quadratic or neither. The picture above shows us the first and second differences. You can see that the relation is quadratic since the second differences are constant. To find the first and second differences you have to do "y2-y1". A parabola is a curved line that is a graph of a Quadratic function. A parabola is shaped like an arch. Parabola's can open either down or up. 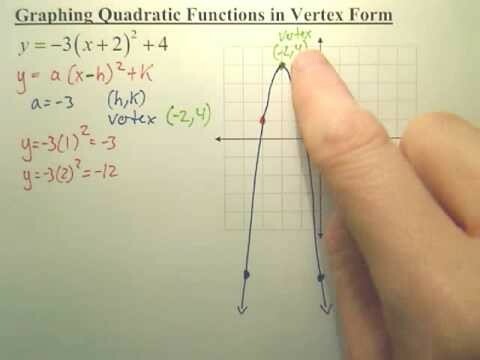 The Vertex form of the quadratic equation is written as "y=a(x-h)²+k". (H,K) is the Vertex, obviously. Axis of symmetry is x=h. The value "a" represents vertical stretch or compression. If "a" is negative, it will be reflection in the x-axis. Now, "h" represents horizontal translation. The "h" inside the bracket will always be opposite. Finally, "k" this tells you the vertical translation. It tells you if its going up or down. If it's positive "k" it will go up and if it's negative, it will go down. It's pretty straight forward. The picture below you can see that the opposite of 2 is -2 and that gives you the vertex (-2,4). The axis of symmetry is -2 and the parabola is open downwards since "a" is negative. With this information you can tell the vertex, the "AOS", vertical translation and the direction of opening. The last part is the x-intercepts. To get the x-intercepts you have to do the step pattern. I think the step pattern is the easiest way to find the intercepts, in my opinion. The Standard form of the quadratic equation is written as y=ax²+bx+c. The "c" value is the y-intercept. "a" value tells us the direction of opening. 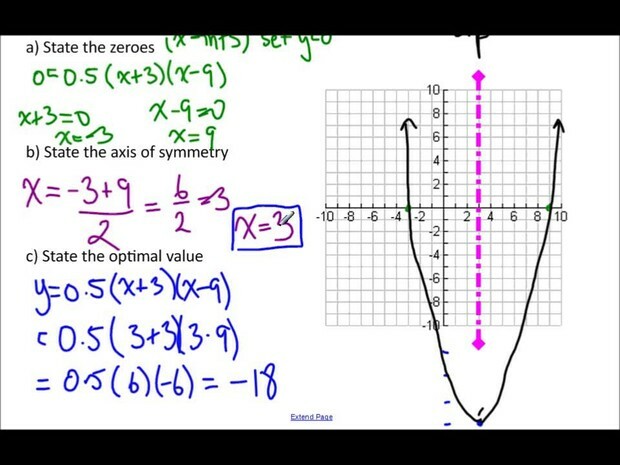 In standard form you want to find the x-intercepts so we use the Quadratic Formula. I will put a pic of the formula. 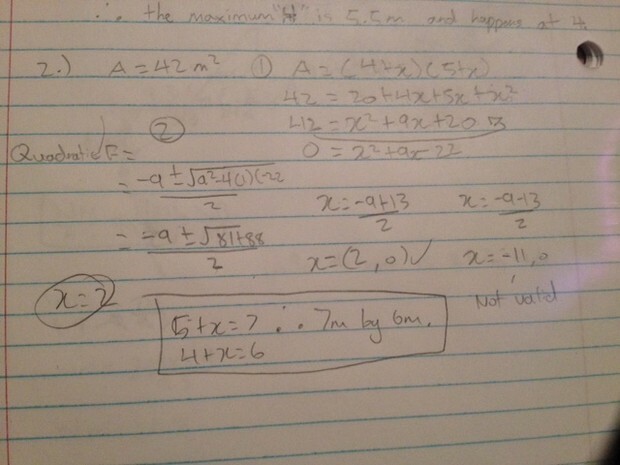 Basically you sub everything into the Quadratic formula and find the two x-intercepts. After you find your vertex by putting the standard form equation into vertex form and from there you will find your vertex. I will put another picture of standard form to vertex. It's very simple. If you do your work, then your good to go. In the second photo you can see how he goes from standard form to vertex. 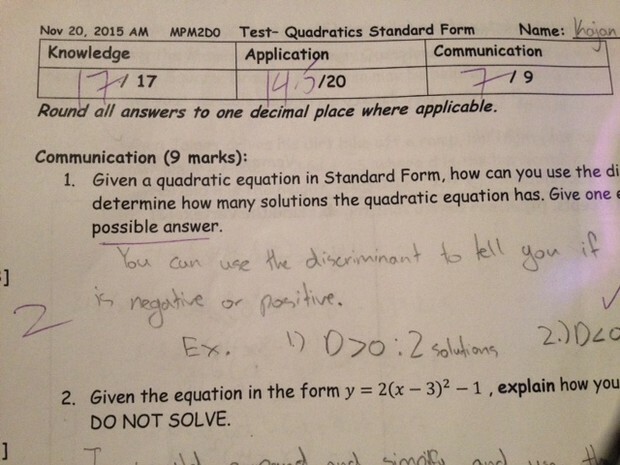 The Factored form of the quadratic equation is written as y=(x-r)(x-s). R&s give you the 2 x-intercepts. 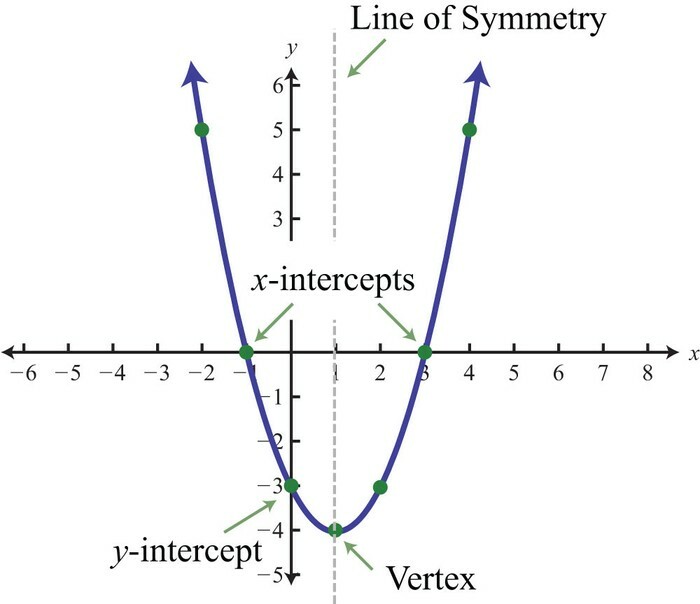 Now to graph this you have your 2 x-intercepts, but you don't have your vertex. We know that the "AOS" is always our vertex point. to find "AOS" you have to do R+S/2. Then you sub the "AOS" into the equation and you have your vertex. From there you will be able to make your parabola. Remember when you take out your "r" & "s" it's going to opposite. Ex. (x-5)(x-6) 1. x-5=0 x=5 x-6=0 x=6 ! ALWAYS REMEMBER! Don't make careless mistakes! 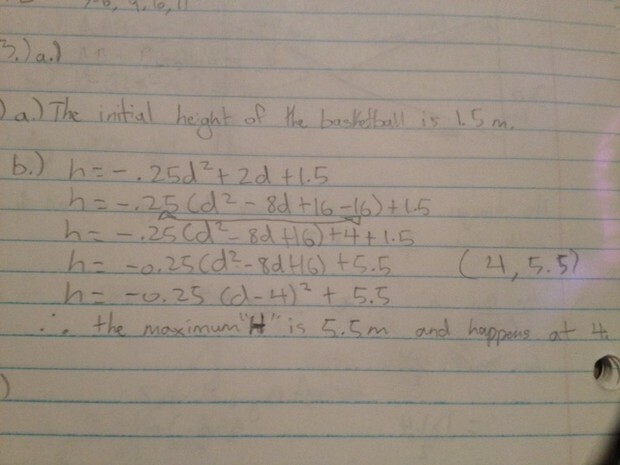 h=-.25d^2+2d+1.5 where h is the height and d is the horizontal distance in metres. distance does this occur at? increasing each side by the same amount. The area of the new patio is going to be 42m2.What are the dimensions of the new patio. The Discriminant formula is D= b²-4ac. The Discriminant can tell you a lot. It could tell you how many solutions you have. You could have 2, 1 or 0. It's really easy, just sub the numbers into the appropriate variables and it should be easy to solve. At the start of this unit, this unit was pretty hard, but I caught up and I was doing good. Now I understand everything. I have a better view now than before. This unit has taught me a lot and I know I'll need to know this stuff in grade 11&12. 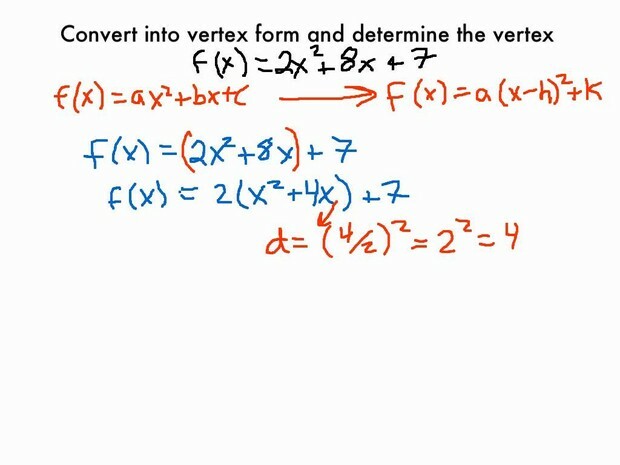 My favourite part in this unit was doing problems where you have to go from standard form to vertex. I don't know why, but I like it. The recent test I did very well and I think I need to keep reviewing and studying to get better, next time.